Like the front but the back is a mess and it is a bit to straight up and down, can anyone tell me what I have done wrong please. It's a lovely design Billie, I really like it. All you've done wrong, and why it's straight up and down, is your easel base isn't big enough. It could do with being a few inches longer and your stopper nearer the front and then it would tilt more. Very nice, he's a jolly looking reindeer. its very bright and cheerful billie ,lovely. 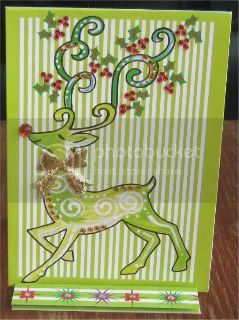 Lovely colours and that reindeer is cute.